The global marketing analytics market is oligopolistic nature due to the presence of few players. 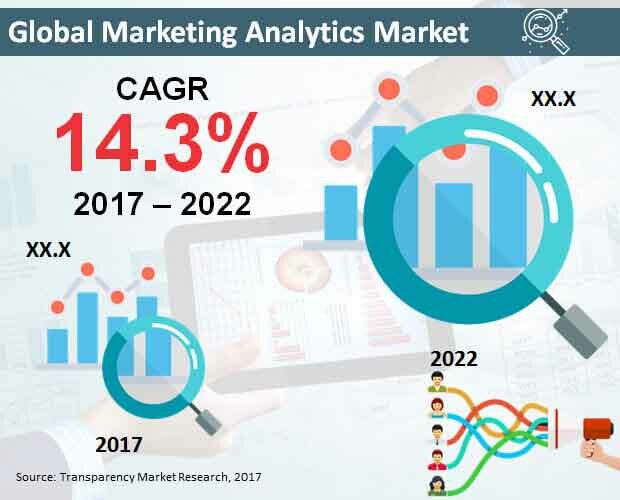 As per Transparency Market Research (TMR), these players are leading the market as they have high proficiency in the field of marketing analytics. Companies are investing into mergers and acquisition to expand their geographical reach on the global platform. The report provide market analysis for the leading companies such as GoodData, Tableau Software, Google Inc., Salesforce, Oracle Corporation, Neustar, IBM Corporation, Pega-Systems, Adobe Systems, and Teradata Corporation. According to the TMR analysis, the global marketing analytics market valued at US$2.1 bn in 2017, and is projected to reach a valuation of US$4.1 bn by the end of 2022. The market is estimated to rise at a healthy CAGR of 14.3% during the forecast period from 2017 to 2022. Based on component type, software platform is expected to lead the market by representing 49.1% of the market in 2017. This segment is likely to rise at 15.2% of CAGR during the forecast tenure. Based on regional analysis, the marketing analytics market is dominated by North America, which holds higher revenue share in the global market. The need for marketing analytics is increasing because it helps to analyze customer behavior and then formulate the online marketing camping and other marketing strategies. It increases the efficiency of the marketing program by the means of computing results and based on those results marketing program takes place. Marketing analytics helps in managing, measuring, analyzing, and controlling the marketing performance with which the manager can provide optimal campaign programs and optimize their return on investment (ROI). The market is expected to rise at a high growth rate as it gives a complete analysis of the market with the major driving factors associated to the market. Increasing digitalization is opening newer opportunities for the companies to expand their business. The global marketing analytics market, is gaining traction with rising popularity of social media channels, to have better understanding of the customers, and to know the exact ROI achieved through online marketing. The increasing use of digital technology and internet, companies are getting into online marketing that require marketing analytics to develop a better understanding of the market. Thus, these factors are going to accelerate the marketing analytics market on an international level. In contrast, to the drivers of the market, some restraints may adversely affect the growth of the market in coming years. Lack of awareness for marketing analytics software and its usage may hamper the growth opportunity of the market. Expensive implementation of marketing analytics software and availability of substitutes in form of open source solutions are considered as the major concerns related to the future scope of this market. Moreover, inability of the managers to exploit analytics software and compete with other mangers in the market also acts as a barrier for marketing analytics market. Thus, by increasing managers capability and knowledge about the changing analytics software will benefit the market to flourish in the coming years.